Notable names fell, qualifiers attracted the attention as play progressed in the Men’s Singles event at the 2017 ITTF Challenge Belgium Open in De Haan but as matters came to a conclusion on the late afternoon of Saturday 4th November, status prevailed. Korea’s Kim Donghyun, the no.8 seed, beat Japan’s Masaki Takami in five games (11-8, 13-11, 7-11, 11-3, 11-8) and thus brought the adventures of the 18 year old, who had started his journey in the qualification tournament four days earlier, to a conclusion. The greater experience of Kim Donghyun, who six days hence will celebrate his 24th birthday on Friday 10th November, was a telling factor; in a critical stage he proved the more secure player, a fact that was endorsed in the second game. After securing the opening game and leading 10-9 in the second, Kim Donghyun lost the next three points, as Masaki Takami seized every opportunity to assume the initiative. Playing consistently, Kim Dongyun won the next three points, the game was secured; a two-nil lead established, breathing space. Masaki Takami responded to win the third game but from the start of the next Kim Donghyun assumed control; in the fourth he established an 8-1 lead, surrendering just two more points, he re-established a two games advantage. “Time Out”; a prudent move, he won the next point, the title was secured. 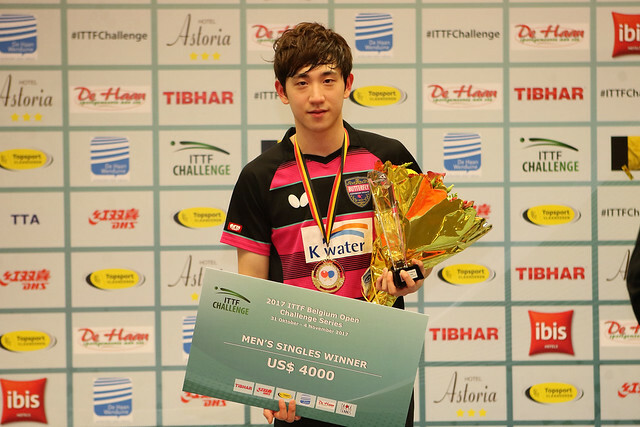 Success for Kim Donghyun, who now looks forward to the next week’s Seamaster 2017 ITTF World Tour German Open, it is a second international success of note. On the GAC Group 2015 ITTF World Tour Bulgaria Open in Panagyurishte, he had won the Men’s Singles event. Furthermore one wonders, Lee Sangsu, Jeong Sangeun and Jang Woojin are very much the favoured option at the moment for the Korean first team; has Kim Donghyun just given the selectors a nudge?